– with the best rates in town. We are locally owned and operated and you are guaranteed to receive quality care from our highly experienced staff. Doggie Business, LLC has expanded our services to offer Doggie Day care (daily boarding), come see our dog day care offering a cage free home environment. Our Dog Daycare hours are Monday – Friday 6 a.m. – 6 p.m.
Boarding: Dogs are able to run and play all day long, and are then boarded in our kennel area at night. This is a great option for either long or short stays. Never board your dog in a boring, lonely kennel again! DayCare- Dog Day Care: Open 7 Days a Week! A fun and supervised off-leash environment where your dog can play, socialize, run and enjoy our indoor and outdoor play areas. 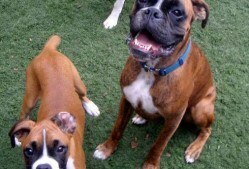 Daycare is a great way for your dog to get exercise and socialization while you’re at work. We guarantee a tired dog at pick-up! We take very good care of your pet in La Crosse, La Crescent, Onalaska and Holmen. 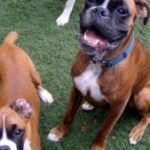 With doggie day care your dog can play, have fun, frolic, and let loose. Love deals? Text DogLax to 724665 for some great weekly Doggie Business deals! Check us out on Facebook!